Dr Cuozzo is a research orthodontist and head of the orthodontic section, Mountainside Hospital, Montclair, New Jersey. He majored in biology at Georgetown University, and has a D.D.S. from the University of Pennsylvania and an M.S. in oral biology from Loyola University, Chicago, Illinois. Dr Cuozzo took the first cephalometric (orthodontic) radiographs of the Neanderthal fossils in France and subsequently in many other countries. He has published a number of articles related to origins from a biblical perspective, and a book, Buried Alive.1 He was a member of the American Association of Orthodontists for more than 30 years. While studying with Francis Schaeffer in the summer of 1977, I acquired the term “true truth.” Dr. Schaeffer coined this term because of the lack of respect the word truth commands in our day. He said it was not a tautology but a necessity. The absolutes, including those in the first chapters of Genesis, are not up for election. They are not running in any ballot, except in the imaginary constructs in men’s minds. I knew this well because I had quite a few of these mental images floating around in my own mind in 1975. It was in that year that the truth set me free from my sin and began to set me free from these mental images concerning the beginning of mankind. Nevertheless, I continued questioning my faith in a literal interpretation of Genesis. So, in 1979, after two years of study in paleoanthropology and the Bible, and with the help and encouragement of Wilton M. Krogman, Ph.D., I embarked on a study of fossil man in Europe. (Dr. Krogman was the forensic anthropologist who identified Hitler’s remains in Berlin at the close of WW II.) My first destination in 1979 was Paris, France, the home of many Neanderthal fossils. We were loaned a sophisticated x-ray machine and an apartment. Fortunately, the assistant director of the MusÃ©e de l’Homme allowed me to work with those precious Neanderthal remains. His parents were rescued by American soldiers after the invasion of Normandy. He said he owed Americans a favor and I was the recipient of that favor. Nineteen years and many museums later, I still express shock at what I found. There have been efforts by many paleoanthropologists to “adjust” the fossils to tell of the glory of evolution rather than the glory of God. I found that the Neanderthals lived longer lives than we do today and that their children had later maturation times than modern children.2 It also seems very likely that they were people who inhabited Europe and the Near East much later than previously supposed and not 200 thousand to 30 thousand years ago. Through anatomical studies and a series of standardized radiographs similar to the ones utilized by orthodontists across the world, I have been able to calculate the Neanderthal lifespan in southwestern France to between 250 and 300 years. I was also able to uncover some misconstructions of the bones which prevented a good scientific interpretation of these remains.3 This information can be found in my book entitled Buried Alive.4 Most people know that the Bible speaks of the early men in our history who lived hundreds of years. With or without my research, that would be true. However, it is my hope that knowing the remains of such people actually exist will help our educated generation love God more with their minds and overcome the challenges to their faith. I have found that the Bible is accurate when it describes time, and historical or scientific facts. 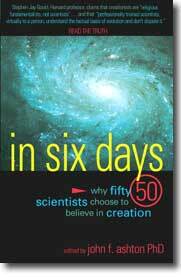 This is why I believe in a literal six-day creation. Jack Cuozzo, Buried Alive, Master Books, Inc., Green Forest, AR, 1998. Jack Cuozzo, Earlier Orthondontic Intervention: A View from Prehistory, Journal of New Jersey Dental Association 58(4), Autumn 1987. Jack Cuozzo, Neanderthal children’s fossils: Reconstruction and interpretation distorted by assumptions, Journal of Creation 8(2): 166–178, 1994.